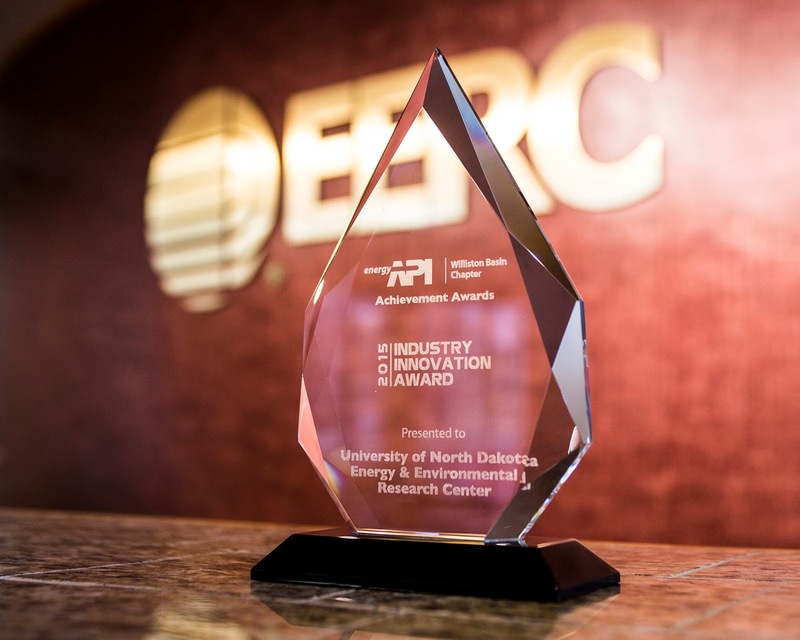 The Energy & Environmental Research Center (EERC) was awarded the American Petroleum Institute (API) Achievement Award by the Williston Basin Chapter of API for accomplishments and positive contributions to the oil and gas industry throughout the Williston Basin. The EERC received the award during the API Williston Basin Chapter’s annual awards banquet in Williston, North Dakota, in mid-November. In attendance were Senator John Hoeven, Congressman Kevin Cramer, Lieutenant Governor Drew Wrigley, State Board of Higher Education Chair Kathleen Neset, and many other dignitaries. The Williston API Achievement Awards highlight the achievements of companies and individuals whose tireless work, innovative solutions, varied business activities, and community involvement produce the energy and economic activity that fuel our communities and country. The EERC won in the Industry Innovation category, which recognizes significant achievement for advancements in technology, systems, processes, and their application in the oil and gas industry in the Williston Basin. Innovative technologies and processes have led not only to the development of oil and gas resources in the Williston Basin but have also provided solutions to associated challenges such as reducing gas flaring, controlling dust, reducing truck traffic, increasing recovery percentage, and more. API’s granting of this award provides a venue for showcasing these innovations and the dedicated companies and professionals who contribute to the continued growth and prosperity of our industry and communities. “We are very honored to have received this prestigious award and sincerely thank the Williston API Chapter for acknowledging the impact our oil and gas programs have on the Williston Basin,” said EERC Vice President for Research Ed Steadman. “We would not have received this award without our industry partners and the hard work, daily diligence, and personal commitment of our amazing team—it is our honor and privilege to work alongside each of them every day,” he said. Vice President for Strategic Partnerships, JohnHarju, was also nominated for Outstanding Achievement – Individual Award. For more information, visit http://willistonapi.com/Awards. The Energy & Environmental Research Center (EERC) at the University of North Dakota (UND), in partnership with the U.S. Department of Transportation (DOT), has begun working on a project to help improve the safety of the nation’s energy transportation pipelines. DOT’s Pipeline and Hazardous Materials Safety Administration (PHMSA) awarded a total of $2 million to 11 different institutions through its Competitive Academic Agreement Program (CAAP), which more than doubles the amount that was awarded last year. 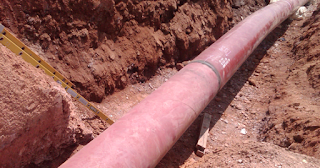 The EERC’s specific project involves evaluating the potential for using specially engineered metal foil to facilitate locating plastic pipelines once buried underground. According to PHMSA, over 69% of the nation’s 2.149 million miles of natural gas distribution pipelines are plastic, and unlike metal piping, plastic pipes have no intrinsic electrical or magnetic properties that can be used to accurately locate them once buried. As a result, accidental excavation damage is the leading cause of reportable incidents for natural gas pipelines. Martin says the EERC will also examine the commercial potential for this pipeline locating system, looking at added cost, pipe integration, and potential value-added features such as a unique identification pattern. The $125,000 project is being conducted in partnership with Metglas, Inc., Conway, South Carolina, the world leader in amorphous metal foil production. In addition to stimulating innovative research, CAAP promotes the involvement of student researchers to illustrate how their engineering or technical disciplines are highly needed in the field of pipeline safety. As part of its project, the EERC will also recruit and hire a UND student to be integrally involved with the experimental data collection and the larger concept evaluation. The EERC recently completed a comprehensive study of the oil and produced water gathering pipeline network in North Dakota. The intent of the study is to improve the performance of produced water and crude oil pipelines in North Dakota, with the purpose of supporting the North Dakota Industrial Commission’s decisions regarding possible adoption of administrative rules impacting pipeline safety and integrity. The EERC is testing a new seismic method for detecting and tracking the carbon dioxide (CO2) injected into oil reservoirs to increase oil production through enhanced oil recovery. By monitoring for physical changes occurring at specific points within a reservoir related to the passing of a CO2 plume, the proof-of-concept technology may provide engineers with useful information about where CO2is moving in a more timely manner than traditional methods. A seismic source (left picture) at a fixed location periodically sends sonic waves into the subsurface. Reflected energy from the reservoir and other geologic layers returns to an array of separate surface receivers and is recorded for analysis. During injection, as the CO2plume moves through the formation past monitored reflection points, the recorded waveforms from the reservoir reflection should exhibit detectable changes, providing a means of determining when the CO2 plume has moved past the monitored reflection points. A total of 96 seismic recorders with three-component geophones are being deployed for this test. Each unit is battery-powered and can operate autonomously for up to 60 days with a minimal environmental footprint. The complete array of receivers offers great flexibility in deploying, removing, and servicing the units. Conventional seismic monitoring methods can provide excellent interpretive results to locate pressure fronts and gas plumes. However, they have some challenges, including high operation costs, large impacts to the survey area because of the great number of receiver locations and source locations required, and long time lapses between surveys. 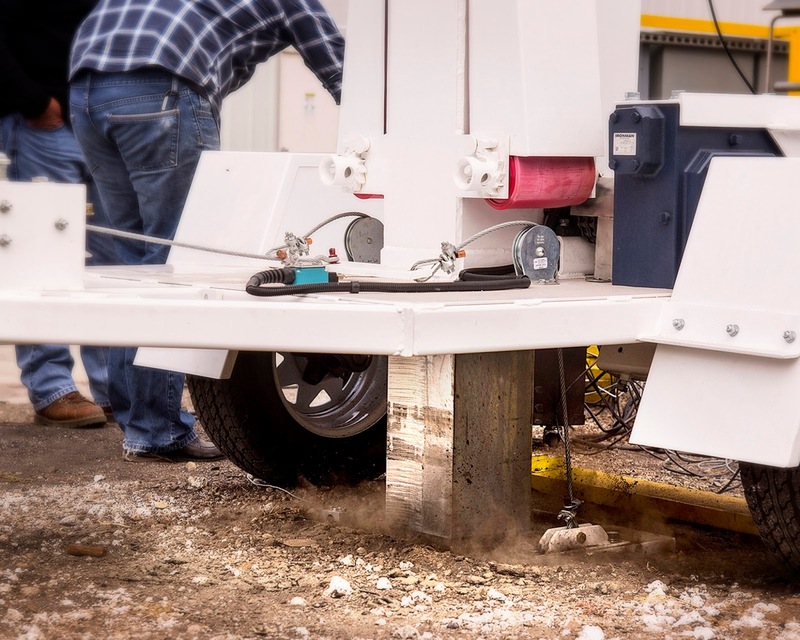 To address these issues, the EERC method employs a sparse array of strategically placed receivers in conjunction with a single seismic source location. Over the course of a year, the source will be remotely operated at weekly intervals, and a series of time-lapse records from monitored reflection points will be collected and processed monthly. Simple processing allows for a fast turnaround of results. The ability to recognize and act on changes observed to be occurring in the reservoir in near real time is anticipated to offer a significant improvement compared to traditional time-lapse seismic methods. The potential exists for both data collection and processing to eventually be automated for even greater efficiencies. Chris J. Zygarlicke, Associate Vice President for Strategic Projects and University Relations, reports on the regional energy summit held at the EERC in May of this year. On May 12, 2016, the Energy & Environmental Research Center (EERC) hosted a regional partnership summit at its facilities in Grand Forks, North Dakota, called Energizing North Dakota’s Future. 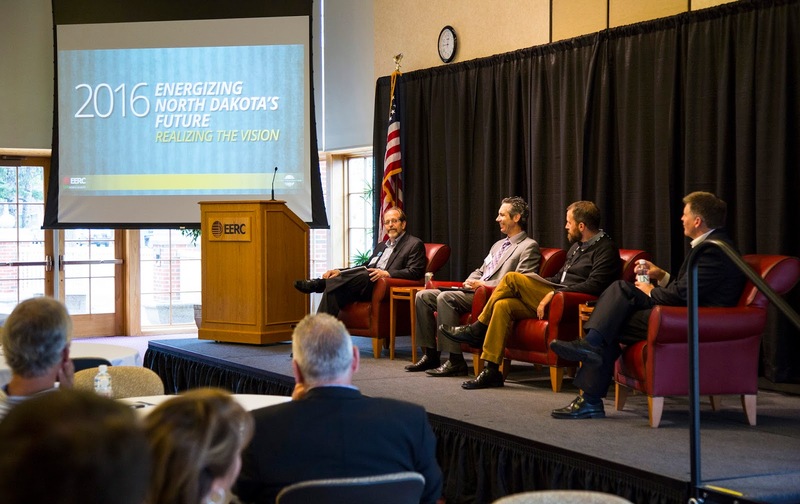 The event’s goal was to stimulate conversation among some of North Dakota’s most influential energy leaders on steps toward charting a positive course for the future of the energy industry in North Dakota. The summit brought together experts from all industrial energy sectors and North Dakota legislators and state officials to discuss an action plan for the upcoming year. Experts highlighted key challenges and opportunities facing the energy industry. 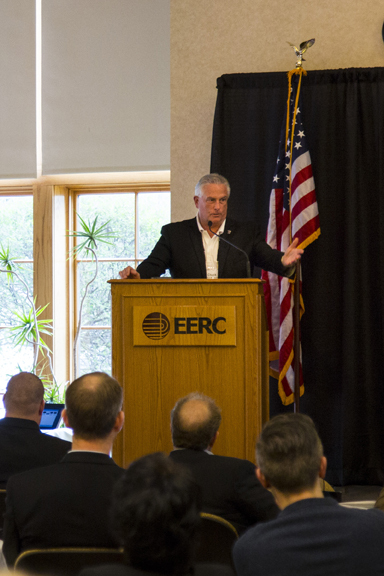 EERC CEO Tom Erickson kicked off and emceed the meeting, emphasizing that North Dakota’s energy picture is one of cooperation, collaboration, and teaming of all industry, government, and public sectors as one of the nation’s largest energy states. Coal, oil and gas, and renewable energy resources must all factor into a balanced energy strategy that ensures security regionally and internationally. A brief welcome was also given by then-Interim President of the University of North Dakota, Ed Schafer. Speaking on key challenges facing the North Dakota energy industry were Jason Bohrer, President, Lignite Energy Council; Ron Ness, President, North Dakota Petroleum Council; and Scott Stone, Counsel, Hunton & Williams LLP. 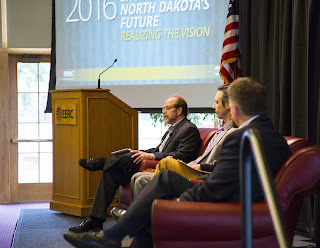 Leading discussions on solutions for North Dakota’s energy future were Scott Wehner, Chief Science Officer, Denbury Resources, Inc.; Robert “Mac” McLennan, President and CEO, Minnkota Power Cooperative, Inc.; and Kathy Neset, President, Neset Consulting Service. The event concluded with the keynote by Charles “Chuck” McConnell, Executive Director of Rice University’s Energy and Environment Initiative and former U.S. Assistant Secretary of Energy, who began by exclaiming that the current Administration’s energy policy is three letters: EPA. Nonetheless, he acknowledged the undeniability of climate change and CO2 as “a” reason for that, considering that since the Industrial Revolution, it is estimated that humankind has released more CO2 into the atmosphere than the rest of human history altogether. "The key for the U.S. energy industry, including North Dakota, is to figure out how we can make a difference in reducing CO2 emissions yet keep pace with other world economies while still providing low-cost, reliable energy," McConnell stated. Energy development in the United States should be globally relevant, so that low-cost fossil energy technologies may allow for similar adoption in poorer countries. For example, the concept of government-subsidized, or even “free” electricity to power an electric vehicle in Sweden is simply not globally relevant. So the question remains, McConnell said, what changes in energy policy can we make that cause low-cost clean energy economies to flourish and that make sense in a global society? Currently, changes are being made in U.S. energy choices and development because of government mandates rather than for the sake of human health and economical energy development. Therefore, enhanced oil recovery (EOR) in North Dakota and elsewhere should be taken seriously and not become a game between coal companies, CO2 suppliers, and oil companies. We need to strategize how to balance the risk of EOR with monetary investment and technology development to make this happen fairly and efficiently. Global investors in Norway and Japan, for example, will be interested in being a part of such a strategic model. The event also served as an opportunity for the EERC to show appreciation to some of its regional partners and to present its Energy Champion Award to Dr. Michael Jones, the Vice President of Research and Development for the North Dakota Lignite Energy Council. Dr. Jones was honored with the award because of his nearly four decades of demonstrated leadership and commitment to energy and environmental research nationwide. In the wake of the 2015 Paris Climate Conference (COP21), the world continues to focus on global climate change. Nations continue to contemplate ways to reduce anthropogenic greenhouse gas emissions, and that means that carbon from energy will have to be part of the discussion. But what does that mean to everyday life? Visitors can navigate through the energy pathway from source through processing, delivery and, finally, to private homes. Visitors are then invited to calculate their own carbon footprint and consider actions. Video clips and tool tips help convey the story. 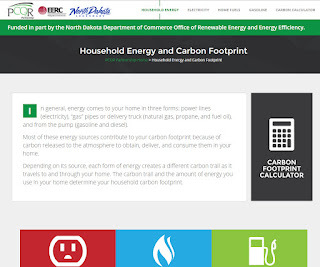 The Web site is funded in part by the North Dakota Department of Commerce Office of Renewable Energy and Energy Efficiency. 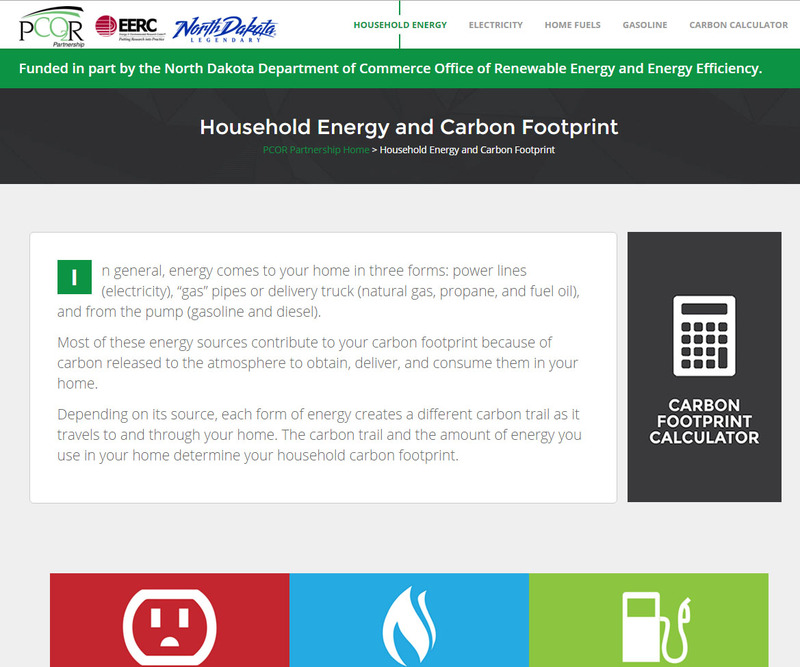 It was developed for North Dakota households, but the site’s calculators and basic information apply to households across the United States. “It’s important for people to know where their energy comes from and what that means with respect to carbon emissions,” said Dan Daly, EERC Senior Geologist and the Web site project manager. Electricity for lighting, appliances, etc. Each form of energy creates a different carbon trail as it travels to and through the home. The carbon trail and the amount of energy used in a home determine the household’s carbon footprint. “There are more than 300,000 households in North Dakota and over 100 million in the United States. In most cases, those homes are attached to electrical and home fuel services, and there’s a fueling station nearby for their vehicles. In today’s world, that means most households produce a carbon footprint,” said Daly. 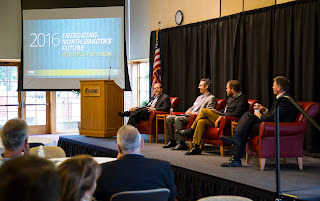 The Energy & Environmental Research Center (EERC), a worldwide leader in the development of solutions to energy and environmental challenges, today is hosting a partnership summit “Energizing North Dakota’s Future: Realizing the Vision,” designed to focus on the steps toward charting a positive course for the future of the energy industry in North Dakota. The summit brings together experts from all energy sectors, along with legislators and state officials to discuss an action plan for the upcoming year. The agenda includes keynote speaker Charles “Chuck” McConnell, Executive Director of Rice University’s Energy and Environment Initiative and former U.S. Assistant Secretary of Energy. Two panels highlighting key challenges and opportunities facing the energy industry feature the following presenters: Jason Bohrer, President, Lignite Energy Council; Ron Ness, President, North Dakota Petroleum Council; Scott Stone, Counsel, Hunton & Williams LLP; Scott Wehner, Chief Science Officer, Denbury Resources, Inc.; Robert “Mac” McLennan, President and CEO, Minnkota Power Cooperative, Inc.; and Kathy Neset, President, Neset Consulting Service. The event concludes with partnership networking events in the afternoon and evening. 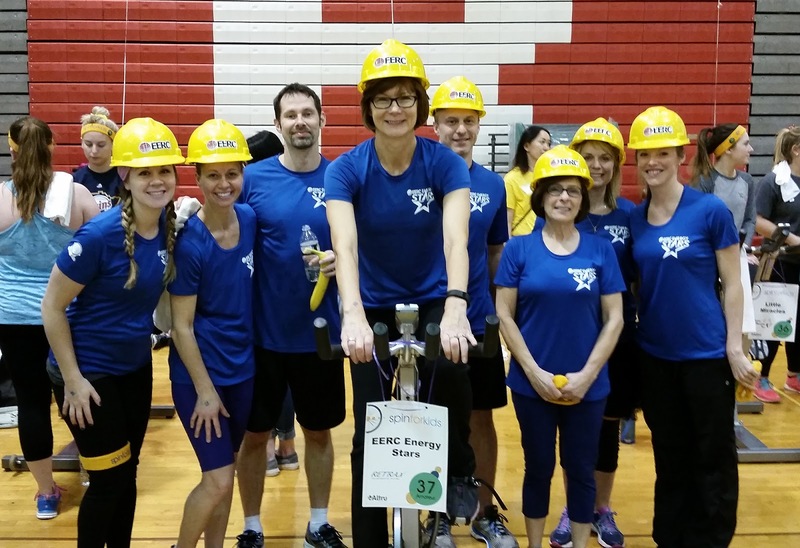 EERC staff members—spinners and nonspinners alike—recently participated in Altru’s Spin for Kids fundraising event. The EERC Energy Stars was one of 32 teams that participated in this year’s event, and the EERC was able to raise over $5300 for this worthy cause. The Spin for Kids program provides funding for critical programs, services, and equipment for kids with special needs in our community and region. As an added bonus, the Engelstad Family Foundation paired up with the cause this year and matched funds up to $75,000, bringing the total raised to a record-breaking $175,000! with a $5300 check at an EERC staff meeting. “It was great to see everyone working together to spin and volunteer the day of the event as well as all of the fundraising efforts that took place leading up to it,” said Kari Suedel. 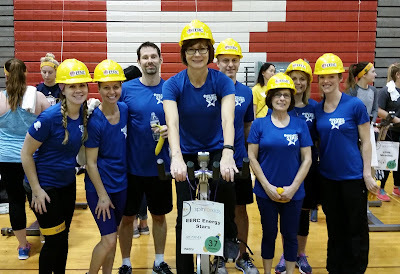 The EERC Energy Stars spin team included Kari Suedel, Angie Morgan, Josh Stanislowski, Carolyn Nyberg, Corey Irion, Debby Johnson, Michelle Olderbak, and Katherine Dunham. Other EERC employees who volunteered the day of the event included Chantsa Dalkhaa, Melanie Jensen, Rhonda Olson, Jane Russell, and Sue White. The EERC is pleased to announce that Dr. Steve Benson has accepted the position of Associate Vice President for Research, working with the EERC’s Vice President for Research and a team of scientists and engineers to develop and conduct innovative projects aimed at solving energy and environmental challenges. Steve brings over 30 years of research and development experience related to the development of efficient and clean energy production systems to the EERC to assist clients in all areas of the energy industry. Steve also serves as a Professor in the Institute for Energy Studies at the University of North Dakota (UND), where he works with students, faculty, and research staff to train the next generation of energy experts and conduct small-scale energy and environmental research projects for government and industry. 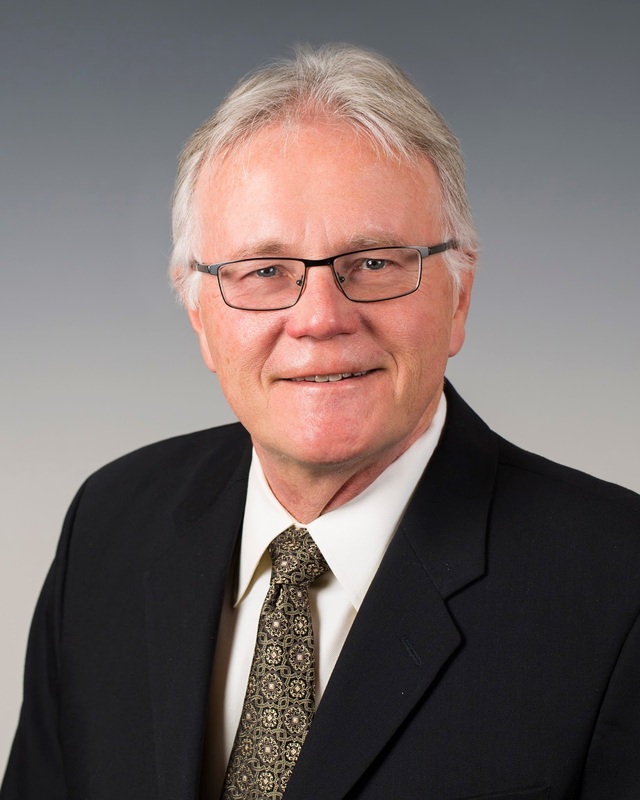 Prior to his current position, Steve was Chair of the Petroleum Engineering Department, Professor in the Institute for Energy Studies, and Professor of Chemical Engineering in the College of Engineering & Mines at UND. Previously, he worked at the EERC as a Senior Research Manager and Associate Director for Research. Steve also served as the Director of the EERC’s Center for Air Toxic Metals® (CATM®). Steve’s principal areas of interest and expertise include the development and management of complex multidisciplinary programs that are focused on solving energy and environmental challenges associated with the development and utilization of fuel resources, including technologies to improve the performance of fuel resource recovery, refining, conversion and environmental control systems; the impact of fuel properties on combustion and gasification systems; carbon dioxide separation and capture technologies; advanced analytical techniques; computer-based models to predict the performance of combustion and gasification systems; the technical and economic feasibility of fuel conversion technologies; and state and national environmental policy. “One of the things that interests me the most about this position is the opportunity to work at a world-class facility with world-class people on developing solutions to energy production and environmental challenges,” Steve said of his new position. “The people here make it a unique place to work, not only because they are fun and great to work with, but they have the abilities to develop the next generation of integrated clean power systems equipped with carbon dioxide capture, sequestration, utilization, and storage,” Steve added. When Steve is not working, you can usually find him running, building wood–fiberglass boats, or restoring furniture that he and his wife have found at yard and antique sales. Family time for the Bensons often involves traveling to see their three children and four grandchildren who live in Houston, Seattle, and the Twin Cities of Minneapolis and St. Paul, Minnesota. The EERC is pleased to welcome Dr. Chantsalmaa Dalkhaa to its Reservoir Engineering team. Chantsa is working with Reservoir Modeling and Simulation at the EERC, where she uses oil and gas industry simulation software to develop numerical models of the subsurface to run dynamic simulations and determine the long-term fate of produced/injected fluids, including hydrocarbons, CO2, and brine. Chantsa holds Ph.D., M.S., and B.S. degrees in Petroleum and Natural Gas Engineering from the Middle East Technical University, Ankara, Turkey. Chantsa also did postdoctoral research in two departments at the University of Calgary in Alberta, Canada: the Department of Chemical and Petroleum Engineering and the Geoscience Department. Chantsa's principal areas of interest and expertise include numerical modeling and fluid analysis in oil and gas, carbon sequestration, solvent and thermal enhanced oil recovery, cold heavy oil production with sand, and related energy and environmental areas. 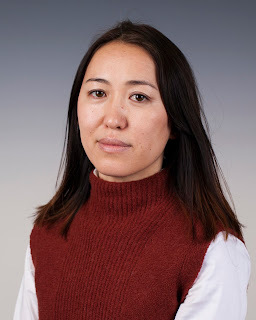 Chantsa grew up in a small town in Mongolia and returns occasionally to visit family. She enjoys her free time outside of work by being active. She bikes, so she is looking forward to biking to work later in this spring. She also likes to hike and found many opportunities with scenic vistas in the Rocky Mountains of Canada, where she did her postdoctoral research. Another favorite hobby is dancing, especially Latin and ballroom dancing. The EERC welcomes Ian Feole, Geological Engineer, to its Geomodeling Team, where he assesses project uncertainties in oil and gas development and geologic CO2 storage for clients by developing geophysical models of the subsurface, performing regional geophysical characterization, and conducting petrophysical analyses of geophysical data. Ian’s principal areas of interest and expertise include rock mechanics, business logistics, CO2 enhanced oil recovery, basin modeling, and remediation. He holds a B.S. degree in Geological Engineering and a B.B.A. degree in Operations and Supply Chain Management from the University of North Dakota (UND). 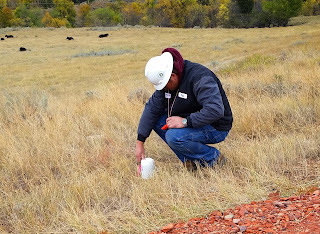 Ian first began working at the EERC as a student, where his primary focus was investigation of potential residual oil zones within the Williston and Powder River Basins. Previously, he worked as a North Dakota Geological Survey Core Library technician and as a Geophysical E-Logger for Braun Intertec. Ian became interested in the area of geology and, more specifically, geological engineering as a career after talking to students and professors at UND about the degree. He admired their enthusiasm and enjoyment of the work that they were doing. The amount of work conducted in the field also interested him, as he enjoys working outdoors. When he’s not working, Ian enjoys skiing, snorkeling, traveling, and attending hockey and baseball games. He also brews his own beer. A native of Shelbyville, Kentucky, Ian has been married since 2012. The EERC is pleased to announce Benjamin Oster has joined the Geomodeling Team as a Geologist. Ben’s primary responsibilities include assessing project uncertainties in oil and gas development and geologic CO2 storage by developing geophysical models of the subsurface, performing regional geophysical characterizations, conducting petrophysical analyses of geophysical data, and evaluating geologic core samples. 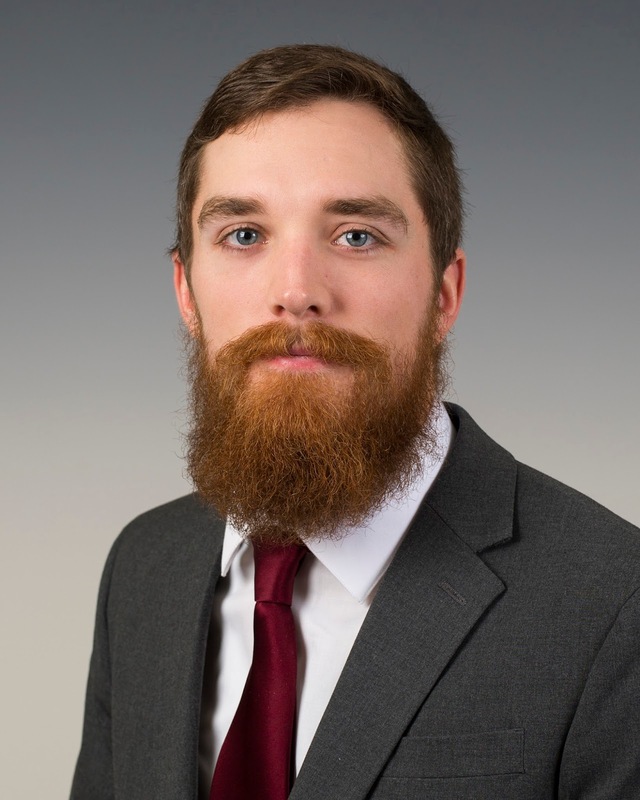 Ben previously worked at the EERC as a student and was involved in client projects dealing with CO2 enhanced oil recovery and saltwater disposal in North Dakota. 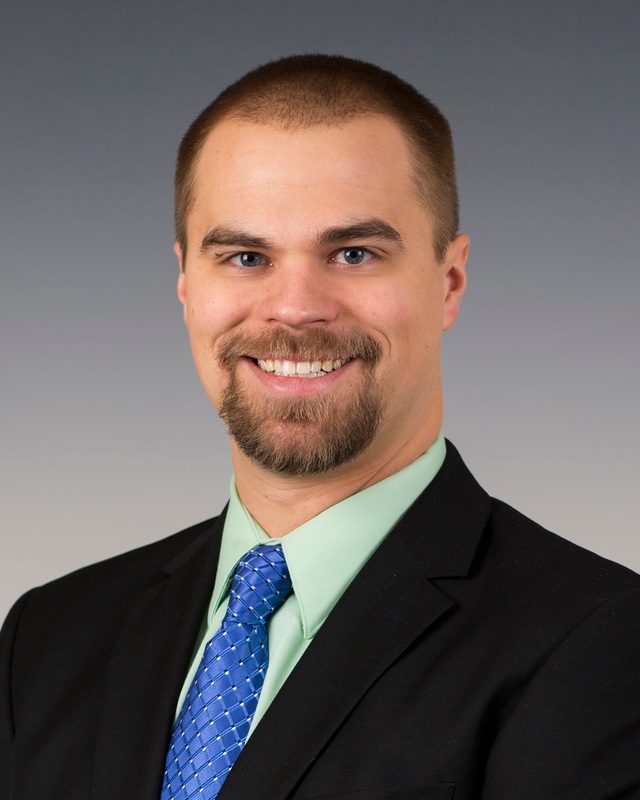 Ben’s principal areas of interest and expertise include well log and core analysis, geologic characterization, geocellular modeling, and CO2 enhanced oil recovery. Ben is currently working on his M.S. degree in Geology at the University of North Dakota (UND), where his thesis research involves using well log and core data to characterize the Winnipegosis Formation of the Williston Basin. He holds a B.S. degree in Geology from UND and A.S. and A.A. degrees from Williston State College. Having grown up on a farm southwest of Williston, North Dakota, Ben was interested in geology from a young age. That interest increased later, when his home was surrounded by the Bakken oil boom. “What interests me most about my job here at the EERC is being able to work with multidisciplinary teams on a variety of challenging projects,” Ben says. When he’s not working, Ben enjoys hunting, fishing, camping, and playing the banjo. 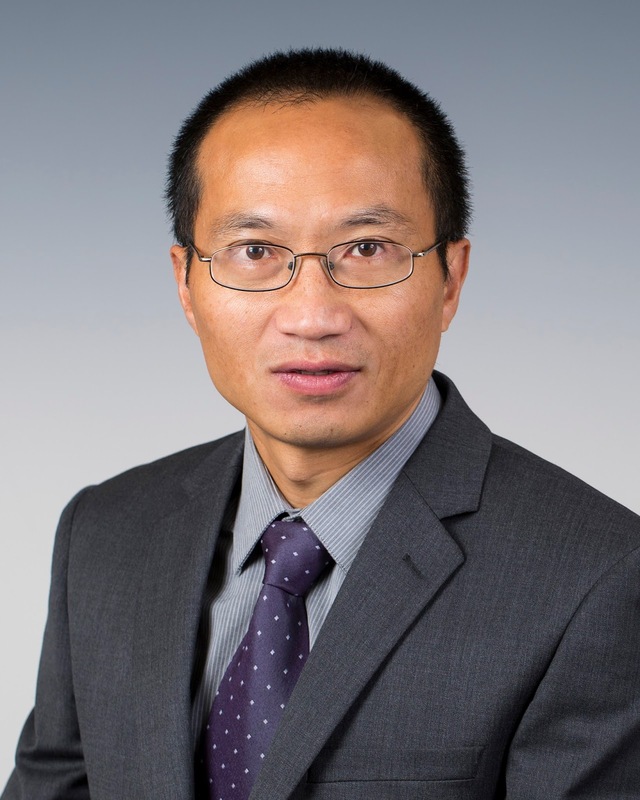 The EERC welcomes Dr. Jun He to its team of oil and gas engineers and scientists. In his position as a Petrophysicist, Jun assists EERC clients by developing geophysical models of the subsurface, performing regional geophysical characterizations, performing petrophysical analyses of geophysical data, and working with a diverse team of scientists and engineers to assess project uncertainties in oil and gas development and geologic CO2 storage. Jun holds a Ph.D. degree in Petroleum Engineering and an M.S. degree in Petroleum Geology from the University of North Dakota (UND). He earned a B.S. degree in Petroleum Geology Exploration from the Southwest Petroleum Institute, China. Jun's principal areas of interest and expertise include geology; petroleum systems; programming; data management; the application of rock mechanics to petroleum reservoir development; the application of geophysics and well-logging principles in the development of petroleum reservoirs; and the application of geophysical methods for monitoring, verification, and accounting for CO2 storage and enhanced oil recovery operations. Jun comes from Wuhang, Hubai, in the center of China. He is married and has a son attending UND. A sports fan, Jun participates in some physical activity nearly every day. He has helped his soccer team become UND intramural champion numerous times. Although his favorite sport has always been soccer, Jun is now discovering that he enjoys playing tennis even more.